During the Book of Eli panel at Comic-Con, Gary Oldman dropped a major piece of news. He said the next Batman movie starts filming next year, and is expected to be out in 2011. 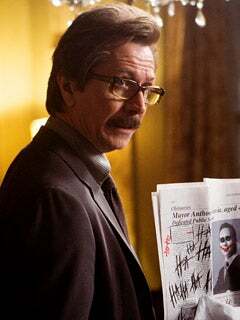 Sounds like he'll be reprising his role as Commissioner Gordon. After he revealed the big news, he said, "You didn't hear that from me." A Warner Bros. representative sitting next to me in the packed auditorium expressed surprise. "They didn't tell us that," she said. This is the first time we've had direct confirmation that there will be another Batman, and that Oldman will be in it.